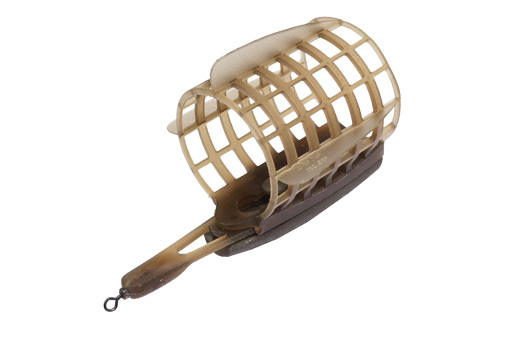 Three sizes of wire cage feeders, each with four side weight options. The weights range from 10 gr on the smallest feeder, right up to 100 gr loading on the biggest! 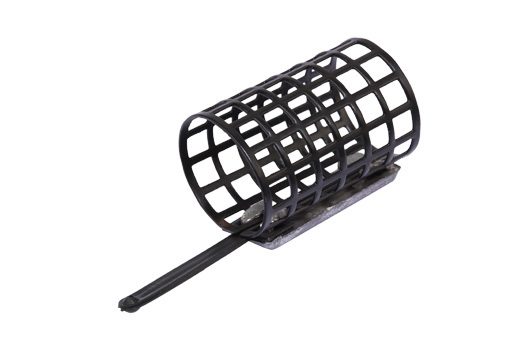 As wire cage feeders go, this design is above average in the way the mesh is anchored to the side weights, plus everything is coated in a robust shiny black finish. The disappointing aspect is the overlong and thick powergum links, which house big silver swivel links. These links are tangle prone and can’t be modified because they are permanently built into the side weights. Offers small, medium and large sizes, along with five different side weights that cover short to long range casting requirements. The plastic square mesh bodies are pretty strong but these groundbait feeders also have plastic fins, which are fragile. The fins are designed to improve in-flight stability and prevent rolling. The interchangeable base weights are a nice touch, allowing anglers to customise these feeders, although I couldn’t slide the weight off the largest size. 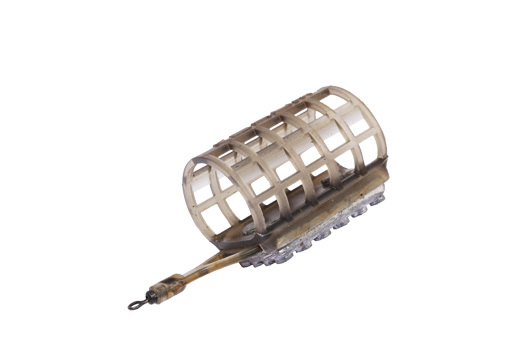 The excellent moulded links have tangle-free semi-encased swivels. Three sizes are available with 4, 5 or 6 rows of square metal mesh, along with side weights ranging from 15 to 28 gr. 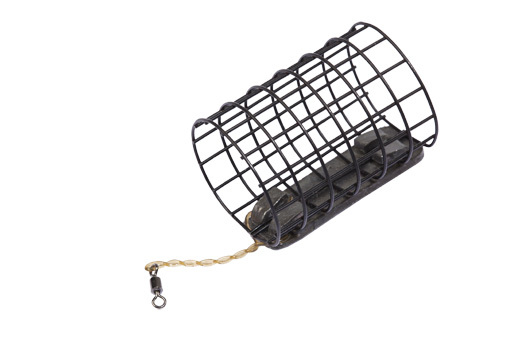 These robust cage feeders have basic plastic links and no attachment swivels, although it is possible to fix a swivel link to them. 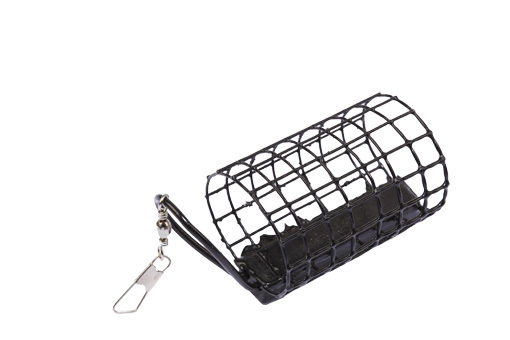 The cage bodies have a tough matt black finish and cast well thanks to their substantial side weights. It’s the semi rigid plastic links that let this product down. It’s tricky to install a swivel link for quick change purposes, while the links are overlong and slightly tangle prone. I remove these and fit rubber ‘O’ rings in combination with swivel links. Classed as ‘Super Heavy Specimen Feeders’, this new plastic mesh design comes in small, medium and large sizes, carrying 1 oz to 5 oz loadings. The square mesh bodies are tough and flattened off underneath, where the side leads are firmly riveted to them. The side leads also have gripper style feet to hold bottom better. They are an unobtrusive pale brown and have neat, tangle-proof links with swivels moulded in. In situations where quick bait-release and extra casting or holding weight are required, this design will be hard to beat. 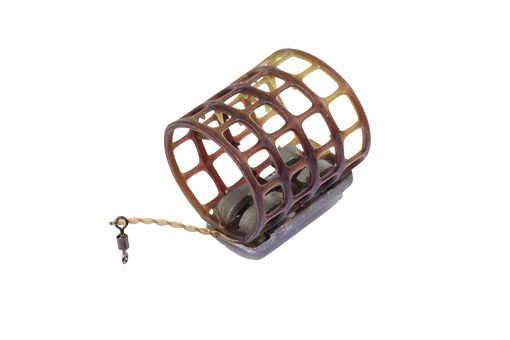 Four sizes of these sturdy plastic mesh groundbait feeders are available, carrying 15, 20, 25 and 30 gr side weights. The body is camouflaged in a mixture of green and brown colours and has tiny spikes inside to grip groundbait and soft pellets. These feeders have well-judged loadings in relation to their body sizes, so they cast good distances. They’re finished off with neat twisted powergum links, which provide simple swivel attachment. Gripmesh feeders are very popular, although I’m not a great fan, disliking the way they prick your fingers when pushing groundbait inside! Great span of tiny to large wire mesh feeders, carrying 10, 14, 17, 20 and 23 gr side weights as they increase in size. The base weights have four anchoring clasps to hold the black coated stainless mesh bodies together, also locking in twisted powergum links, which are neatly finished with attachment swivels. Although not as robust as some of the plastic versions, these are about as unobtrusive as you can get, offering a versatile range of sizes and loadings. This covers everything from delicate feeding to attacking with much bigger loads that need to be released quickly. NOTE: All products tested February 2010. All prices correct at the time of going to Press. Angler’s Mail do not take responsibility for price or product changes or current availability.